Ixia viridiflora with its turquoise blue flowers is one of the real stars of the genus. Bulbs are available for sale in autumn ready for planting. The flowers open as a clear turquoise blue, they do need good sun to open fully and will close up on a cloudy day and in the afternoon. From the Cape Province in South Africa, this is one of the rarer varieties. Growing from small corms and with fine grassy foliage it is a bulb that thrives on neglect. Combined these traits with brilliant flowers on tall stems and we have standout plant for the dry border. These easy care bulbs can also be grown in pots and containers, in full flower it creates a stunning effect. Over time this easy care bulb will form a good clump. Plant is a very well drained soil, if needed add some extra drainage material. In containers, mix some perlite into the potting mix to improve drainage. Generally full sun is the best position, however in very hot areas, some protection from the afternoon sun is warranted. 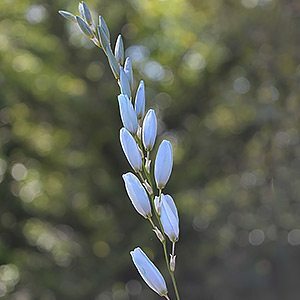 Although Ixia viridiflora does not require a lot of fertiliser, we do use a little slow release fertiliser a few weeks after new growth commences. The occasional watering with a liquid seaweed fertiliser also seems beneficial. In areas with very wet summers, bulbs can be lifted and stored as soon as the foliage dies back. This is also a good time to lift the bulbs for division. 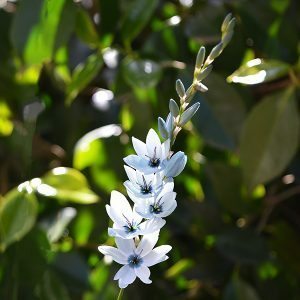 Ixia viridiflora bulbs are available for sale from the following nurseries.